Endeavorist Ambassador position: part-time, virtual, potential for some serious beer money. Help us bring curious people together to crowdfund education, business ventures, or experiments- and get paid to do it! Endeavorist Ambassadors represent and promote Endeavorist within their academic and social environments, primarily with the purpose of driving new, active users to the platform. They are passionate individuals who understand the scope and mission of Endeavorist. Help us identify open-minded students and researchers in need of funding for their projects, and encourage them to crowdfund their work via Endeavorist. For every campaign that is launched by the ambassador, we pay $100. If the campaign successfully completes, we pay $50 or 2%, which ever is greater. Applicants can read more about responsibilities here or email ambassadors@endeavorist.org for more information. Busy today, but more coming soon. In much happier news, Carmen Drahl is back and blogging! Excellent news. I want to wait a respectful amount of time before I comment on it, but I do want to express my profound sadness that there have been layoffs at C&EN. Best wishes to those affected. Tewksbury, MA: Cambridge Isotopes is looking for an experienced Ph.D. synthetic organic chemist. Also, a group leader. You are a highly motivated scientist with a strong organic and/or metallic polymer chemistry background. You will become an integral member of a top-caliber team focused on the discovery and development of novel anti-cancer therapies based on cancer metabolism and apoptosis, branching out to other diseases over time. Sherman, TX: Austin College is looking for an experimental physical chemist. An interdisciplinary chemist is preferred (such as materials, computational, environmental, bioorganic, or biophysical chemistry) but other areas of expertise considered. Manhattan, KS: Kansas State is looking for a professor of chemical engineering at all levels. Portland, OR: Reed College is looking for an assistant professor of inorganic chemistry. Letter to the editor: who to believe on Alzheimer's? “Alzheimer’s Next Chapter” by Lisa Jarvis highlights the lack of consensus regarding the primary mechanism of neurodegeneration in Alzheimer’s disease (C&EN, June 1, page 11). This is a significant problem because understanding the causal mechanism of a disease process provides a rational platform for drug development. Unfortunately, the Alzheimer’s field is dominated by two exclusive ideological factions—tauists and βaptists. In our opinion, this situation has impaired the search for effective pharmacotherapies. The myopic focus on the amyloid-β plaques and neurofibrillary tangles is dangerous and frankly unwarranted, since the presence of protein anomalies does not necessarily indicate pathogenic significance. In this regard, it is noteworthy that some evidence suggests that the tangles and plaques are of secondary pathophysiological importance. Regardless, the failure to adequately consider alternative mechanisms can prematurely narrow the field of hypothesis testing. Initial studies in the field of Alzheimer’s disease neuropathogenesis identified nerve terminal dysfunction and defective mitochondrial bioenergetics coupled to oxidative stress as early consequences of Alzheimer’s. Whereas some might consider these to be outdated parameters, the resulting changes in central nervous system neurotransmission represent a plausible basis for the cognitive deficits that characterize the disease. Based on the probable complexity of Alzheimer’s neuropathogenesis, it is clear that the molecular process of Alzheimer’s disease neurodegeneration is highly complex and, as Genentech’s Carole Ho points out, the most effective approach will likely involve combination therapy. I don't understand Alzheimer's biology well enough to have an opinion on this letter, other than to say that I wish that C&EN would offer some sort of third-party explanation to go along with these letters. I guess the problem with my desire is that someone with enough Alzheimer's biology experience to have an informed opinion is going to be either a "tauist or a βaptist." There's this strange aspect of the letters to the editor at C&EN to act as an outpost of Medical Hypotheses. It's both interesting (always makes for great reading) and question inducing, but still I feel it needs more context from a trusted source. There was the titanium in sunscreen one, just a couple weeks back. There was the cancer carcinogenesis letter. Here's one on regenerating tissue from July. And then the one about using ultrasound in Alzheimer's research/therapies? All of these are really interesting, but (as I have said) it'd be great to get some sort of expert opinion to accompany them. Overthinking it, I'm sure. Cover story on the top 50 chemical companies by Alex Tullo. No idea how high Sinopec was on the list. Lisa Jarvis writes on the latest Alzheimer's clinical results from Biogen and Lilly. A disappointment, to be sure. Melody Bomgardner writes on the problems at Molycorp, the United States' only rare earths mine. Speaking of supply problems with elements, Cheryl Hogue writes on recycling helium for academic instrument usage. I find letters to the editor like this one kinda annoying, but I can't quite figure out why. It's probably just me. ...It is left to the reader to judge the reasons behind the decision to shut down the Varian NMR operation in this ruthless manner; it is perhaps too soon to reach any meaningful verdict. Future MBA student projects will doubtless examine how it was possible to pay an immense cash sum to acquire another company, and then close it down after just four short years. The wider science community will deplore the massive and irreplaceable loss of personnel and expertise in the key areas of chemistry, structural biology and clinical imaging. Here the most widespread reaction will be incomprehension. ...“It creates its own frenzy,” said Rebecca Flint Marx, editor of San Francisco Magazine’s food section, who noted that not only are cruffins a cult item — and at $4.50, relatively affordable — but they are also camera-ready, as photos on Instagram attest. Fillings include caramel, strawberry milkshake or Fluffernutter cream (among other flavors), depending on Mr. Stephen’s mood. What is interesting is that very few people believe that a competitor was the thief - so who was it? In my time in the chemical manufacturing industry, I've yet to see classic IP theft of this sort, i.e. stolen lab notebooks. There are, of course, cases where the copies of the maps leave the boat in people's heads or their flash drives, but that's a different matter. Create an independent federal agency that requires submission of all new medical procedures and proposes a fair price. Further cut Medicare prices for physician services. Focus the Patient-Centered Outcomes Research Institute, created by the PPACA, to evaluate the benefits new medical services provide for the money. Allow people to import cheaper doctors from Canada or Mexico for personal use. Force them to live on Canadian or Mexican wages while working in the United States. Passing new laws to make it easier for nurses, nurse practitioners, general contractors and other allied medical personnel (or just plain interested amateurs) to perform medical procedures. Make it more difficult for physicians to find other sources of income, such as supplements, ancillary services or daytime television talk shows. Encouraging organizations like the American Chemical Society to protest high physician wages. *Here's a good and serious Matt Herper piece on it. I want to think about his piece more. ** The median oncologist made about $290,000. Just to send it on down the line: is being a chemist meaningful? 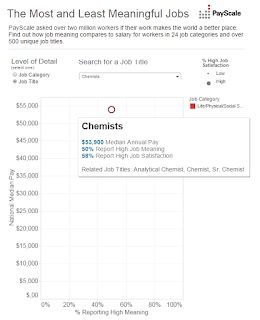 From Jordan Weissman at Slate, an interesting survey from PayScale, asking if chemists find "high" meaning in their work. A bare majority, apparently. 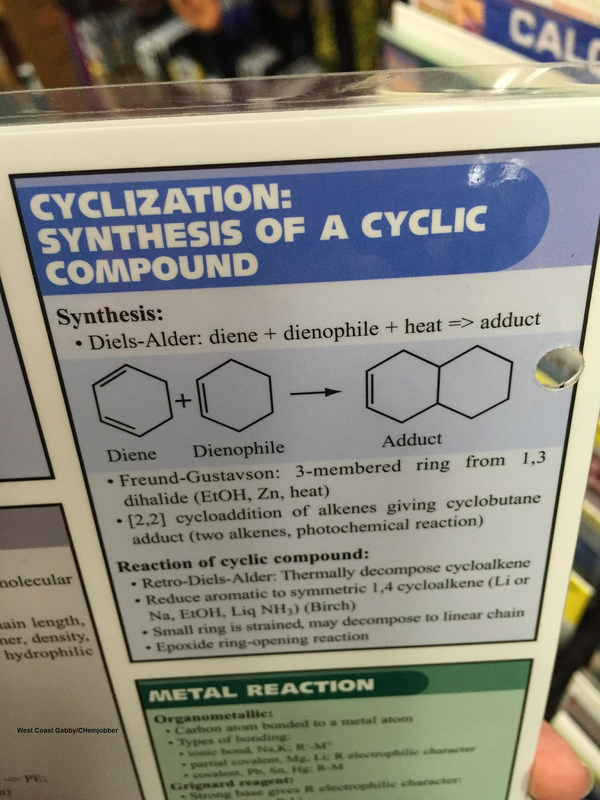 Readers, do you find your work as a chemist meaningful? PNA Innovations is looking for a B.S./M.S. organic chemist with experience in peptide chemistry. Position is in the Boston area and there is no relocation. Qualified candidates please send your resume to careers@pnainnovations.com. Full job description can be found at the link below. While my portfolio in my current job has been broad, first and foremost, I am a chemist. I hold a BS in chemistry with Honors from Canisius College and MS and PhD degrees in chemistry from the University of Rochester. After earning my doctorate, I held faculty appointments at Cal Poly and Rice University before coming to Washington, D.C. in September 2001 as a Congressional Science and Technology Policy Fellow. As Senator Markey mentioned, on 9/11 my fellowship cohort was in orientation when word came about the attacks on our Country. Later that day, I went to the Pentagon as a volunteer with the American Red Cross to serve emergency workers responding to the attack. This experience shaped my decision to accept a fellowship placement in then Congressman Markey’s office where I staffed the Bipartisan Task Force on Nonproliferation. My time on Mr. Markey’s staff gave me insight into the impact that a bipartisan policy process can have when people work together to achieve a common goal. After my fellowship, I returned to Rice University to join the Center for Biological and Environmental Nanotechnology, where I served as Executive Director. My research focused on the environmental, health, and safety implications of engineered nanomaterials. This part of my background is particularly relevant to the activities of the Chemical Safety Board because it is where I earned my experience with worker health and safety. It seems to me that, for a lot of chemists, these policy fellowships are the first step in getting involved in government policy careers. Dr. Kulinowski, thank you for your willingness to serve. At some point, I would love to visit with you about nanotechnology and how the periodic table does not work, those very small extremes, the potential there and the challenges. I get Senator Boozman's point ("the physical properties of nanomaterials are unique or unusual"), but it came out a little funny. Cleveland, OH: Lubrizol is looking for 2 Ph.D. research chemists; paying $90,000-$100,000. Not bad for Ohio, one suspects. Ewing, NJ: Tyger Scientific looking for an experienced synthetic organic chemist. Glassdoor review: "The pay is just so-so, and the work isn't easy." Yes! South San Francisco, CA: Three positions posted by Genentech recently. Gilead: A raft of positions, mostly process, both in Foster City and Edmonton. Also: JEOL (the NMR company) posting 3 sales/field service positions. Chemical Operations Specialist, you'll be there and prepared whenever a community is flooded, an earthquake shakes the foundations of a city, a hurricane makes landfall, or an enemy uses biological or chemical warfare. You will know what to do to evacuate the area, control the situation, and solve the problem. "You know what to do" sounds vaguely like Starship Troopers, incidentally. Seattle, WA: Can someone tell me what this MarqMetrix position has to do with chemistry? Bakersfield, CA: CSU-Bakersfield is looking for a tenure-track assistant professor of organic chemistry for fall 2016. Storrs, CT: B.S. chemist technician position available at the University of Connecticut. Orangeburg, SC: Want to be a chair of a chemistry department? Claflin University is looking for one. Tuscaloosa, AL: Postdoctoral position in organometallic chemistry, towards "transition metal catalysis and in the area of ruthenium anticancer compounds." Thoughts on getting a (federal) government position? [C]an you or someone else with inside knowledge put together a guide for how to get through government job applications? If anybody has ever found a job through USAJobs, you know how onerous and painful the application process is. You have to register for a new account for like 3 different sites before you even get to the application for some of them! And everything I've read says they're intensely specific, so one mistake and your app gets tossed. Here's the last time we talked about this issue, over two years ago. I thought this comment, this comment and this one were good. Readers, your thoughts on USAjobs and applying for state and municipal positions in general? Letter to the editor: Hey, where are all the ads? A recent issue of C&EN has just two classified ads, both for academic positions (June 15, page 37). Is this because of full employment, because downsizing is not over, or because of the summer doldrums? It makes one wonder about our chosen field of expertise. 1. It's not because of full employment. 2. It's 45% because of the summer doldrums. 3. It's 50% because all the ads have migrated online. Employment of chemists and materials scientists is projected to grow 6 percent from 2012 to 2022, slower than the average for all occupations. Average for all occupations is 11%. Pretty awesome cover story by Bethany Halford on nonagenarian chemists. Unsurprisingly, they're mostly academics. Yet another point for academia, I think. Interesting article on Piramal on their API contract manufacturing by Jean-François Tremblay. "Piramal is an Indian company that the Food & Drug Administration has so far not cited for quality problems or data inconsistencies...." Is that "FDA has visited them and found no problems?" or the White Oak popo haven't shown up yet? Marc Reisch interviews the CEO of DuPont's spinoff, Chemours. NB Chemours laid off 9,000 workers worldwide, including workers from its Belle, WV plant in early June. Interesting Letters to the Editor on that "sleeping beauties" article (on papers highly cited, many years after publication). I wonder if it is true that most of them are colloid-related. Diane Grob Schmidt, the current ACS president, notes that she is attempting to engage industrial members. I like the idea of a "CTO summit", although I suspect that most of the results will be business-oriented ("we want lower taxes! ", "less regulation!") than not. I also like the idea of her and Tom Connelly making calls on the different CEOs/CTOs around the industry. I would sincerely hope that issues of chemistry employment are on the agenda. Boston College unlawfully retaliated against a bipolar chemistry professor when they blocked his attempt to reintegrate into the university after a mental-health-related medical leave, according to the findings of a state agency. The university has been ordered to pay the professor, William Armstrong, back wages and $125,000, as well as interest, because of harm inflicted, according to a decision issued this month by a hearing officer at the Massachusetts Commission Against Discrimination. Boston College has appealed. The decision also reveals that Armstrong himself retaliated against a professor in the department, including writing an attack e-mail about his colleague under a fake name. But the commission, which is charged with enforcing anti-discrimination laws, ruled that Boston College erred when it pledged to accept Armstrong back into the school following his medical leave but instead retaliated, going so far as to move his lab and office out of the chemistry building. Wow, that's quite an accusation. The whole document is here; it's certainly an interesting read. To me, this instance shows the difficulty that faculties face when considering tenure: you're choosing to work with this person for the rest of your (or their) professional life. I'm not surprised that the department (Hoveyda?) chose to retaliate against Professor Armstrong (or refuse to do the utmost to re-integrate him, anyway); however, I am surprised that they did so in a less-than-legal (apparently) manner. One also presumes that the story is not done here. Blog contest: This machine goes "hiss!" and "ping!" @chemprofcramer: rotating frame! rotating frame! 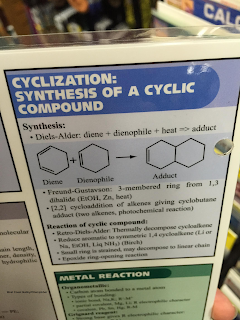 @chemjobber: There's a radio pulse, and a spinning thing and it goes ding! So, for amusement, I am offering a fine prize to the person who can offer the funniest, yet most accurate explanation of a chemical spectroscopic technique. Nominees to be decided by commenter acclaim, winner to be decided by a panel to be determined. Deadline for entry in the comments or by e-mail by midnight (Eastern time), July 24, 2015. The fine prize: A 1 pound bag of hard candies, a certificate fit for framing, 50 of the finest Chemjobber business cards, a handwritten thank you note (by me) and a $10 Starbucks gift card. Looks like people are being paid all right in Switzerland? From Salzer et al. Chem. Eur. J. 2015, 21, 9921. 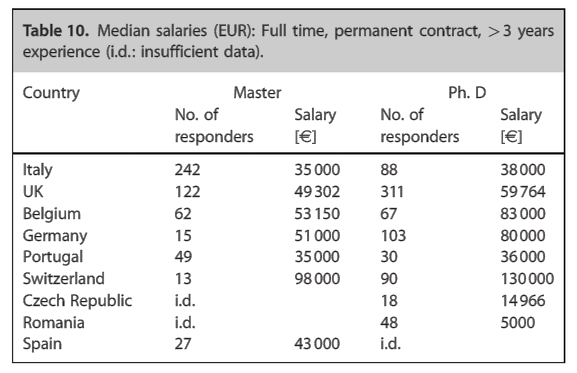 I am busy today, but I wanted to make note of my befuddlement with the pan-European employment survey published in Chemistry: A European Journal in June. I have been meaning to write on it for a while, but finally untracked myself this morning on Reddit. There are some very interesting tidbits in the survey, including the suggestion that the unemployment of the respondents was 3%. I'm skeptical of that number, but I am far more skeptical of our ability to learn anything from this survey, because of the difficulty of getting good data out of such a disparate population of chemists. ...EuCheMS currently has approximately 160000 individual members organized in 42 national member societies and supporting member groups. Those societies who agreed to participate in the survey account for approximately 90% of EuCheMS membership. We have no idea how well this survey reflects the actual makeup of European chemists. 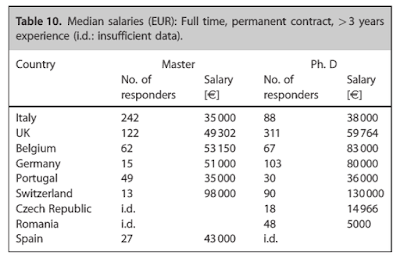 We have no idea how well this survey reflects the makeup of European chemical societies. There was no attempt to understand who did not answer the survey. What was the response rate? There was no explanation of responses removed from the survey or why, just that it was "rigid." We know that they focused on people who graduated in the last 15 years, but that they have a respondent who is 87 years old (did they throw that person out?). While I think the survey is interesting, I don't think anyone should draw any conclusions from it. Readers, your thoughts? Satoru Iwata on layoffs: "laying off a group of employees will not help to strengthen Nintendo's business"
I have clear childhood memories of this NES game, "Top Gun." Nintendo global president Satoru Iwata believes that his company can get back into the black without firing any of its employees, through good ol' fashioned efficiency and cost-saving measures. "It is true that our business has its ups and downs every few years, and of course, our ideal situation is to make a profit even in the low periods, return these profits to investors and maintain a high share price," Iwata said during a recent shareholders meeting, in response to a question about "corporate restructuring" as a solution to Nintendo's problems. "If we reduce the number of employees for better short-term financial results," he continued, "employee morale will decrease, and I sincerely doubt employees who fear that they may be laid off will be able to develop software titles that could impress people around the world." Iwata also noted that global exchange rates have played a major part in Nintendo's financial situation, saying that "the influence of exchange rates is the main aspect of this matter," rather than Nintendo's headcount. "Employees make valuable contributions in their respective fields, so I believe that laying off a group of employees will not help to strengthen Nintendo's business in the long run," he said. "Our current policy is to achieve favorable results by continuously cutting unnecessary expenses and increasing business efficiency." It's a shame that more pharmaceutical company executives don't think this way about their R&D scientists. I've not had a ton of experience with double cone dryers, but I know that they are a common means of drying compound. They are certainly unique-looking - I presume that it took many years to come up with that shape. McConville's "The Pilot Plant Real Book" mentions that the agitation is gentle and you get decent product homogeneity, which is good. I presume that you load up the product in one handway, turn on the vacuum (and the heat?) and allow it to slowly rotate and dry product. As the video shows, they don't rotate very fast. When you're done, you get your bag ready and open it up and let the product fall down? Dunno. I am going to guess that cleaning one of these things is a bear, but again, not much personal experience with them. This Reddit thread is a great reminder of the hidden truth of REUs - while, yes, it's nice and desirable for you to have presentable science and impressive results at the end of a summer, it's just as much about you learning what it's like to be in a working academic research laboratory. So, relax, do your best and wear your PPE. Newark, DE: Air Liquide is looking for an experienced M.S./Ph.D. chemist for a senior analytical chemist position. Amused at the italicized "industrial" in the experience requirement. Piscataway, NJ: Colgate Palmolive has a postdoctoral opening; sounds pretty interesting and the experience (oral care formulations) would certainly be unique. But why is this a "post doctor" position and not an entry-level senior scientist position? This position requires smoking to assess the sensory characteristics of cigarettes; therefore, is open to current users of tobacco products only. Huh: This Bay Area position at a small company is looking for a "research associate" on C&EN Jobs, but doesn't ask for a chemistry degree. You're back: Been a while since I've seen an Anichem ad - they're looking for B.S./M.S./Ph.D. synthetic organic chemists. ACS Boston Career Fair Watch: 14 positions so far, including 4 at Unilever in Connecticut. How easy is it to find a job in Canada (senior chemist / group leader / lab manager or similar)? How can I compare my current salary in the UK with wages in Canada? What about house prices? In the UK, we have the NHS; how does the system work in Canada? Who sorts out visas, me or my prosepective employer? Are visas easy to get? What about citizenship, should I bother? Where would I most likely get a job in Canada (BC, Toronto, Quebec)? I still don't know enough about the Canadian pharmaceutical/chemical industry to answer this question competently. Readers, any thoughts? Fall 2016 search begins: Creighton University (Omaha, NE) is looking for an assistant professor of analytical chemistry. Bellingham, WA: This instrument specialist position at Western Washington University requires only a B.S. in chemistry; that said, it sounds like an awful lot of work for $38,748. Middlebury, VT: Middlebury College looking for a laboratory instructor (M.S./Ph.D.) for January 2016. Newark, DE: The University of Delaware is looking for a chemical hygiene officer. B.S., 4 years of experience desired. Last minute lecturer: UT-San Antonio is looking for a visiting assistant professor; biological mass spectrometry experience desired. Paying 60-70k - not bad! The bailout is conditional on Greece passing agreed reforms by Wednesday. These include measures to streamline pensions, raise tax revenue and liberalise the labour market. Though it included an offer to reschedule Greek debt repayments "if necessary", there was no provision for the reduction in Greek debt - or so-called "haircut" - that the Greek government had sought. Well, we shall see if the Greek parliament passes these measures. Any bold predictions? I suspect that they won't pass it, but we shall see. What the PASS lobbyist forgot to mention was that during this period sunscreen use also skyrocketed. In fact, just in the past decade (2001–10), the incidence of melanoma increased by 1.5% (www.cdc.gov/cancer/skin/statistics) while the use of sunscreen remained stable (National Cancer Institute, “Cancer Trends Progress Report”). Although sunscreen clearly protects against sunburn—the redness, swelling, and pain due to inflammation—it is not at all clear that it also protects against skin cancer. In fact, in what has been dubbed the “sunscreen-melanoma controversy,” a number of recent studies have reported either an increase in skin cancer incidence with increased sunscreen use or else no correlation between the two. Two current hypotheses attempt to explain this surprising disconnect. Thomas M. Chiang and others implicate the inhibition of nitric oxide synthase by sunscreens (Melanoma Res.2005, 15, 3). It has also been known for decades that the inorganic titanium and zinc oxides commonly found in sunscreens have a dual effect: Not only do these crystals filter UV-A and UV-B light, they also catalyze the photogeneration of reactive oxygen species (ROS), for example, superoxide and hydroxyl radicals. These ROS can then oxidize DNA and trigger mutations that lead to cancer. The bottom line is that although it makes sense to apply sunscreen as a protection against sunburn, one should not assume that this also protects against the later development of skin cancer. The latter correlation has not yet been proven, and some literature even suggests the opposite. My question is this - how do ROS get past the epidermis? Worthwhile cover story on oil spill cleanup this week from Jyllian Kemsley. Did not know the 18X difference in scale between Exxon Valdez and Deepwater Horizon. Stephen Ritter covers the shift in fluorochemical makeup away from PFOA. Jean-François Tremblay notes that Chinese chemical firms have gotten caught up in the stock market mess. Cheryl Hogue notes the academic concerns about the high cost of helium these days. Fun infographic by Andy Brunning on the chemistry of barbecue. Also, congratulations to Harry Elston on his being named a 2015 ACS Fellow. It is well deserved. For our German readers, don't forget there's a German chemistry job market blog. SeeArrOh asks, "what happened to EJCorey.com?" Jyllian Kemsley notes the detailed OSHA violations for the DuPont methyl mercaptan leak that resulted in 4 operator deaths. Geeky Girl Engineer is in Greece and is sending back lots of nice pictures, happily, very few of which have to do with major monetary policy decisions. Michelle Francl tackled the Monday NYT puzzle. Quintus is grumpy about a Sarpong paper. Ash talks about Hans Bethe. Wish I knew what I had an unfair advantage in. Via David Perrey, catalytic earthworms in Mannich reactions - seriously! Looks like Novartis is looking forward to Entresto going commercial; good news for R&D chemists there. John gets tracked down by his alumni association. Detroit has an IT skills gap! Shortage! Cue panic! Did I miss anything? Leave it in the comments, please. Have a good weekend. Kansas City, MO: SynTech Research is looking for an experienced research chemist; looks like agrochemical research, analytically-related. Novato, CA: BioMarin Pharmaceuticals is looking to hire a postdoc for work with cell culture; at least they make reference to publishing peer-reviewed articles. Akron, OH: Goodyear is looking for a Ph.D. polymer chemist; 5+ years of experience desired. West Deptford, NJ: Johnson Matthey is looking for a Ph.D. chemist to work on their homogenous catalyst team. Roseville, CA: Hewlett Packard is looking for a "Chemist, Social and Environmental Responsibility"; M.S. or Ph.D. desired. 100-115k offered; whoa. Early in the season? : University of San Diego is looking for a tenure-track assistant professor of biochemistry for the fall 2016 season. Storrs, CT: Two medicinal chemistry postdoctoral positions open at the University of Connecticut Department of Pharmaceutical Sciences. Portland, OR: Reed College is looking for a 0.5 FTE teaching associate. Lowell, MA: The University of Massachusetts Lowell wishes to hire chemistry lecturers. Courtesy of West Coast Gabby, a study guide that fails its owners. How should a chemist judge a physician? It was at one of these parties where Randy overheard a dentist extolling some brilliant young oral surgeon who had just moved to the area. Randy had to bite his tongue not to start asking all kinds of questions about just what "brilliant" meant in an oral-surgery context—questions that were motivated solely by curiosity but that the dentist would be likely to take the wrong way. Among coders it was pretty obvious who was brilliant and who wasn’t, but how could you tell a brilliant oral surgeon apart from a merely excellent one? It gets you into deep epistemological [s--t.]* Each set of wisdom teeth could only be extracted once. You couldn’t have a hundred oral surgeons extract the same set of wisdom teeth and then compare the results scientifically. And yet it was obvious from watching the look on this dentist’s face that this one particular oral surgeon, this new guy, was brilliant. So later Randy sidled up to this dentist and allowed as how he might have a challenge—he might personally embody a challenge—that would put this ineffable quality of oral-surgery brilliance to some good use, and could he have the guy’s name please. A few days later he was talking to this oral surgeon, who was indeed young and conspicuously bright and had more in common with other brilliant people Randy had known—mostly hackers—than he did with other oral surgeons. He drove a pickup truck and kept fresh copies of TURING magazine in his waiting room. He had a beard, and a staff of nurses and other female acolytes who were all permanently aflutter over his brilliantness and followed him around steering him away from large obstacles and reminding him to eat lunch. This guy did not blanch when he saw Randy’s Mercato-roentgeno-gram on his light box. He actually lifted his chin up off his hand and stood a little straighter and spake not for several minutes. His head moved minutely every so often as he animadverted on a different corner of the coordinate plane, and admired the exquisitely grotesque situation of each tooth—its paleolithic heft and its long gnarled roots trailing off into parts of his head never charted by anatomists. When he finally turned to face Randy, he had this priestlike aura about him, a kind of holy ecstasy, a feeling of cosmic symmetry revealed, as if Randy’s jaw, and his brilliant oral-surgery brain, had been carved out by the architect of the Universe fifteen billion years ago specifically so that they could run into each other, here and now, in front of this light box. He did not say anything like, "Randy let me just show you how close the roots of this one tooth are to the bundle of nerves that distinguishes you from a marmoset," or "My schedule is incredibly full and I was thinking of going into the real estate business anyway," or "Just a second while I call my lawyer." He didn’t even say anything like, "Wow, those suckers are really in deep." The young brilliant oral surgeon just said, "Okay," stood there awkwardly for a few moments, and then walked out of the room in a display of social ineptness that totally cemented Randy’s faith in him. One of his minions eventually had Randy sign a legal disclaimer stipulating that it was perfectly all right if the oral surgeon decided to feed Randy’s entire body into a log chipper, but this, for once, seemed like just a formality and not the opening round in an inevitable Bleak House-like litigational saga. Does anyone buy this stuff? What would it take for Washington (i.e. Seattle) to become a "global leader in life science innovation"? A 11.5 earthquake in the Bay Area that forces Stanford, UC-Berkeley and UCSF to relocate to Seattle? 20X the current rather substantial federal life sciences R&D funding that Washington gets? Ask CJ: How much should I ask for in equity? There's potentially an opportunity for me to take a job at a startup company. They're small. Currently [n < 5] employee[s] small, have been around for [n < 3] year[s]. Taking this would be a big pay cut (but still being paid) but I would get equity. 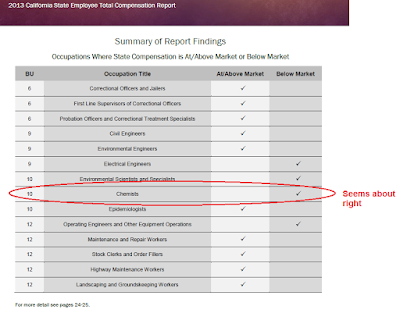 How do you assess what is reasonable compensation in terms of equity? In terms of risk, obviously it could fail, my equity would be worthless, and I'm out of a job. Are there are other more subtle risks I'm not thinking of? Thankfully it's local, so I wouldn't need to move for this. I have no idea how this sort of thing works; undoubtedly there's some sort of "what percentage of a company do founding members get" convention that readers know about that I do not. How much is this company worth, in the best case? How much of that is the ownership willing to give me? What kind of a hit am I going to take by working here? What portion of the company's future revenues will make up for that actual hit to my salary? I am obviously looking at this all wrong, so readers, please correct me. The Internet portal that provides scientists in many Greek universities and research institutes with access to electronic journals from 27 publishers suspended many of its services on 1 July because the government has not provided the funds to keep it going. Greece’s stormy economic climate has meant that the Hellenic Academic Libraries Link (HEAL-Link) has come close to shutting down multiple times over the past decade. But now faced with the threat of state bankruptcy, scientists are not expecting rescue funds to become available this time around. Greece defaulted on a critical debt repayment to the International Monetary Fund on 1 July, and the country's banks had closed to forestall financial panic. A referendum on 5 July on the terms of a proposed bail-out could determine whether Greece will stay in the eurozone. “HEAL-Link is particularly vital to universities, which rarely have funds for institutional journal subscriptions,” says molecular biologist Nektarios Tavernarakis, director of the FORTH Institute of Molecular Biology and Biotechnology (IMBB) in Heraklion, Crete. Like other leading non-university research institutes in Greece, the IMBB has its own subscriptions to relevant journals, so is not as dependent on HEAL-Link, Tavernarakis says. HEAL-Link will still be able to provide archival issues of journals. Some of the publishers have agreed to a three-month grace period to continue providing new issues of their journals. But for others, no new issues will be made available from now on. (Reuters) - Pharmaceutical companies said on Monday they would continue to supply medicines to Greece for now, despite increased financial uncertainty after Greeks rejected the terms of a rescue package from creditors in a referendum. Drugmakers are owed more than 1.1 billion euros ($1.2 billion) by Greek hospitals and the state-run health insurer, after not being paid since December, but have promised to keep supplying the country on humanitarian grounds. The European Federation of Pharmaceutical Industries and Associations (Efpia), representing 40 drug companies, said it stood by a commitment made last week to ensure supplies continued for the coming month. Interesting that the academic publishing companies don't feel the same potential public pressure as pharma companies to provide their goods without payment. Let's play "find the actual scientist!" Posed pictures of science company CEOs are always funny. 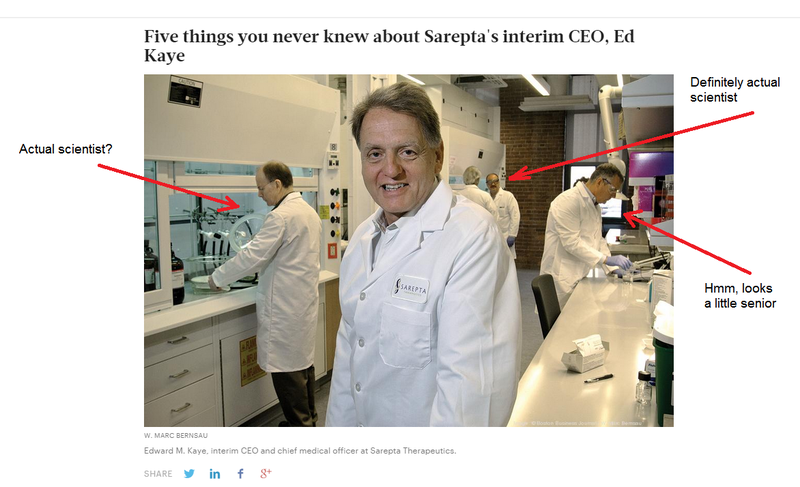 A respected reader sent in this Boston Business Journal picture of Sarepta CEO Ed Kaye; there's some sciencey-activity going on in the background. I'd like to know what the person on the left is doing with the empty dessicator? Meanwhile, many investors don’t regret their bets on stocks even in the face of the latest drops. Li Ping was among those who sold homes to free up cash to invest in stocks, hoping for better returns. In April, 51-year-old Ms. Li sold her three-bedroom apartment in Beijing’s eastern Chaoyang district for 7 million yuan ($1.13 million). Since then, she has parked 4 million yuan in the stock market via a fund manager. “The fund that I have invested in is very mature and professional,” she said, adding that she thinks the market will stabilize and rise again. Ms. Li has a lot at stake. She now lives in a rented apartment with her husband near his workplace. Her older daughter is married but her younger daughter is going to high school in the U.S. Ms. Li, who works in the insurance industry, said she needs her stock investment to yield more than 20% a year to cover her daughter’s school fees and other expenses. “The yield I’m getting is definitely more than the rent I pay,” she said. Nanosyn, a CRO in Santa Clara, CA is looking for outstanding synthetic organic chemists. Multiple positions can be filled at the BS/MS or PhD level. Candidates should expect to spend the majority of their time at the hood making molecules. Please visit the careers section on http://nanosyn.com/ for more details. Offer acceptance rates for new graduate school classes up or down? A weird question: has anyone said anything about the incoming class of graduate students for fall 2015 and their relative acceptance rates for your institution? I have heard some rumblings about relatively poor offer acceptance rates for incoming graduate students in a major chemistry program; curious if that's just an anomaly, or a sign of an improving economy for B.S. or M.S. new graduates. The Rodionov Group at the Catalysis Center at King Abdullah University of Science and Technology (KAUST) is a lab focused on micellar and supramolecular catalysis and emergent phenomena in nanoscale systems. We invite outstanding postdoctoral researchers to apply for two open positions. Flexibility, ability to work in a team, and excellent communication skills in English are mandatory. Equally important are scientific curiosity and creativity. Successful candidates will work with state-of-the-art instrumentation in a highly collaborative, multidisciplinary environment. Group members will enjoy a high degree of creative freedom. Excellent opportunities for mastering new experimental techniques and for co-authoring high profile research publications will be provided. A strong background in polymer, synthetic organic, or colloidal/nanoparticle chemistry is desired. Preference will be given to the candidates with experience in organic synthesis or polymer synthesis/characterization. The specific areas of expertise we are looking for are ATRP, RAFT and NMP polymerization methods; GPC, light scattering and electron microscopy; and standard Schlenk line techniques for handling air-sensitive compounds. The projected start date is October 1, 2015. KAUST is located 80 km north of Jeddah on the Red Sea in Thuwal, Kingdom of Saudi Arabia. Newly opened in September 2009, KAUST is an independent merit-based research university that has attracted exceptional researchers, faculty and students from around the world. KAUST offers world-class facilities, competitive salaries and a wide range of benefits. Further information on KAUST and its unique campus can be found on the Web at http://www.kaust.edu.sa/. Please submit a cover letter, CV (including a list of peer-reviewed publications), reprints of the three most significant publications (for postdocs), and contact information for three references to Professor Valentin Rodionov by email to valentin.rodionov@kaust.edu.sa. Mention job reference CSJ0630 in your application. Important: PDF files are preferred. Please submit complete applications only. Review of the applications will begin immediately and will continue until all the positions are filled. I was wrong (most likely)! We're not muddling through at all, it appears. With the "no" vote by Greece on the mostly-defunct terms of a potential bailout deal, it looks like we're headed for... something bad? Definitely bad for anyone who's a Greek citizen and has a lot of money in Greek banks? I'm no expert. Bold prediction (a.k.a CJ doubling down): France convinces Merkel/Germany to extend Greece another (not-very-helpful) lifeline, kicking the can down the road by one month. Also, commenters to tell CJ where he's wrong. Those of you who like puzzles and problem solving, try out this New York Times puzzle. I'll put my result in the comments. 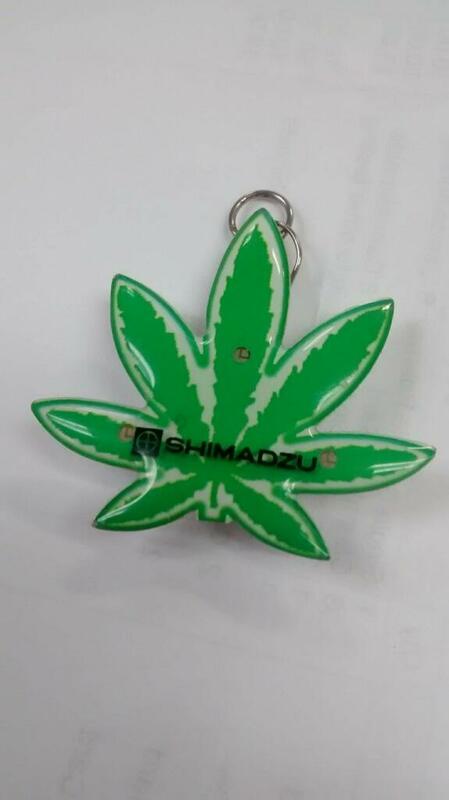 Shimadzu's in for cannabis chemistry! 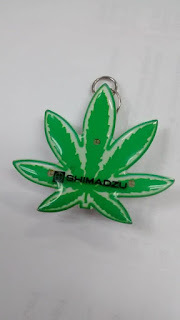 An informed source shows me a picture of an interesting freebie handed out to cannabis testing laboratories by Shimadzu. In for a penny, in for a pound, apparently. I read with interest the business article on fumigants (C&EN, June 8, page 18). I find it hard to believe that the California State Legislature would approve methyl iodide as a crop fumigant. I base this on both its potential toxicity to farmworkers (it is a powerful alkylating agent) and on the lack of scientific studies that may turn up currently unknown oncogenicity, genotoxicity, and neurotoxicity. Could the Environmental Protection Agency focus some of its attention away from carbon dioxide long enough to fund this important work? Does the $2.6 billion strawberry crop hold any sway? I don't know the science around methyl iodide, but it seems to me that it would be a bit less hazardous to farmworkers than methyl bromide (from a volatility perspective.) That said, I'd expect it to be no less toxic to them, if exposed to enough. Surely there must be a safer alternative? Cover story on C&EN's "Talented 12", a group of young chemists. Congratulations to those selected! Interesting "chemical roots" page for them. Fun editorial by Amanda Yarnell on ChemDraw's 30th birthday, including a Derek Lowe anecdote. Letter to the editor on the Tim Hunt kerfluffle. You ask me Why I Love Her? Well, give me time and I'll explain. Have you see a Kansas sunset or an Arizona rain? Have you watched a cold fog drifting over San Francisco Bay? Where men who braved a hard new world first stepped on Plymounth's rock? Have you seen the mighty Tetons? Have you watched an eagle soar? Have you see the Mississippi roll along Missouri's shore? Her waters rage along the shore in thunderous display? When you see the surf come roaring in at Waimea Reef? My heart cries out, my pulse runs fast at the might of her domain. My Beautiful America, beneath God's wide, wide sky. It is the Independence Day holiday in the United States, so I am a little slow posting. More soon. SFO: Not much more for the San Francisco sci/biotech category, but this M.S. chemist/software position sounds interesting. 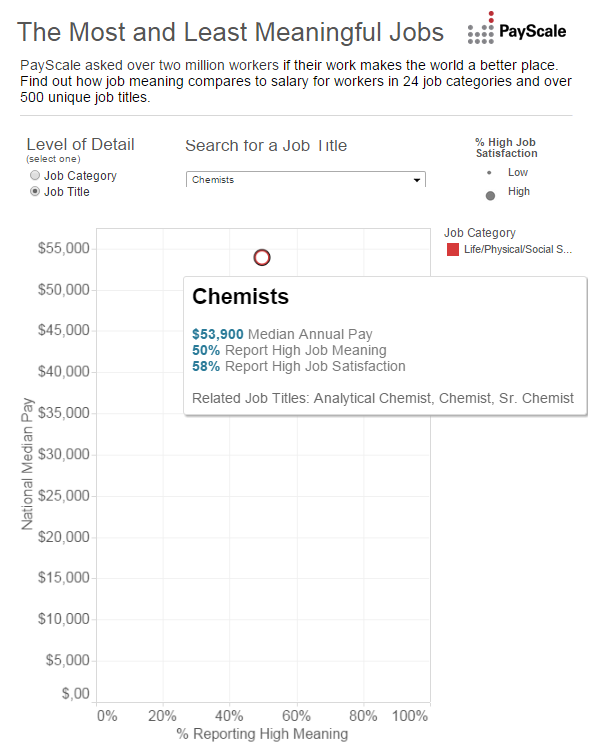 A broader look: Monster, Careerbuilder, Indeed and USAjobs.gov show (respectively) 985, 637, 9537 and 17 positions for the search term "chemist." LinkedIn shows 743 positions for the title "chemist", with 26 for "research chemist", 74 for "analytical chemist", 11 for "organic chemist", 1 for "synthetic chemist" and 3 for "medicinal chemist." I have been remiss in not posting on this; Jyllian Kemsley has a good rundown of resources for women who find themselves pregnant while working in the laboratory, in terms of chemical safety. Be sure to read the comments, too, as there are a lot of resources there as well. Finally, I agree with DrAmazon (in the comments) that this seems like something where (for ACS insiders) both WCC and DCHAS could pick up the ball and run with it. ...the total compensation for half of state-employed chemists is less than $8,985 per month ($5,715 in salary, plus $3,270 in benefit costs). That's 33 percent less than the median total compensation for federal chemists, nearly 13 percent less than the midpoint for local-government chemists and almost 6 percent below the private sector. It's well known, for example, that some unions are more powerful than others. I clearly remember from my time as a resident of the Golden State that the correctional officers union was regarded as being very powerful. One presumes that the union for California state-employed chemists (California Association of Professional Scientists) is not nearly so powerful. Anybody have summer reading recommendations, now that it's July? ...I turned the valve until a trickle of hydrazine came out. I let one drop fall into the iridium bowl. It undramatically sizzled and disappeared. But hey, that's what I wanted, I just freed up hydrogen and nitrogen. Yay! ...With my mini-torch in hand, I started a slow hydrazine flow. It sizzled on the iridium and disappeared. Soon I had short bursts of flame sputtering from the chimney. The main thing I had to watch was the temperature. Hydrazine breaking down is extremely exothermic. So I did it a bit at a time, constantly watch the readout of a thermocouple I'd attached to the iridium chamber. Point is, the process worked! Chemistry plays a pretty big role in "The Martian" and I really enjoyed it. Readers, got any other books to recommend? ...These practices create an unacceptable risk of beta-lactam cross-contamination in other beta-lactams and in non-beta-lactam APIs. ,,,Cleaning cannot substitute for proper segregation. Cross-contamination with your sensitizing agents can initiate life-threatening allergic reactions or other drug-induced hypersensitivity reactions. Your current practices demonstrate an unacceptably high risk of beta-lactam cross-contamination into other APIs packaged at your facility. You should conduct all beta-lactam manufacturing activities in dedicated, segregated facilities with separate air handling systems and production equipment. "No safe level" is pretty strong language, even for a FDA warning letter.